Spacecraft detected powerful gamma-ray flares from a supernova remnant known for its steady glow The composite X-ray, visible-light and infrared view of the Crab nebula above shows an array of complex knots or wisps. One such wisp may be the site of a recent massive gamma-ray outburst. Astronomers have long considered the Crab nebula one of the steadiest sources of high-energy radiation in the universe. Radiation from the supernova remnant is believed to be so constant that astronomers use it as a standard candle with which to measure the energetic radiation of other astronomical sources. 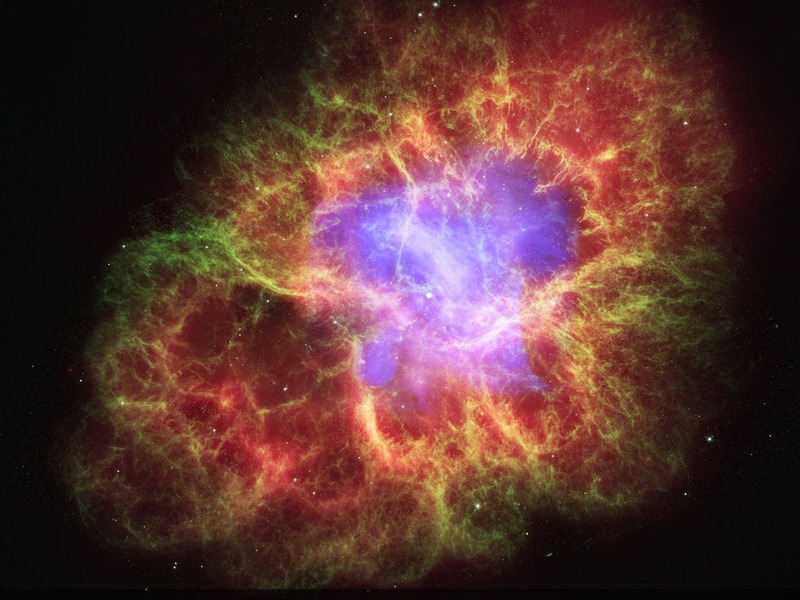 Researchers are astounded, however, when two spacecraft recently recorded giant gamma-ray outbursts from the Crab, the remnants of a stellar explosion 6,500 light-years from Earth that was observed by humans in 1054. The Crab’s gamma-ray radiation suddenly became two to three times stronger for three days beginning September 19, scientists with the Italian Space Agency’s AGILE telescope reported in a September 22 Astronomical Telegram, an e-mail communication. Researchers with Fermi’s Gamma-ray Space Telescope found an even larger increase over roughly the same time period, they reported in a telegram (obviously someone hasn't discoovered email yet!) on the following day. Both teams also announced they had found evidence of previous flares — the AGILE telescope recorded an outburst in the fall of 2007 while the Fermi team spotted one in February 2009. The suspected source of the energetic flares, along with steadier radiation emanating from the nebula, is blizzards of electrons spat out by the Crab’s pulsar — the rapidly rotating, exploded cinder of a star that lies at the very center of the Crab nebula. But figuring out exactly how the electrons got revved up to energies of at least 1015 electron volts — the most energetic charged particles ever associated with a distinct astrophysical object — for so short a time has astronomers scratching their heads and searching for new models. Finding the flares “was a shock,” said AGILE team member Marco Tavani of the INAF-IASF in Rome and the University of Rome Tor Vergata, who spoke about the findings at the meeting on December 6 and 7. In fact, when his team first noticed a sudden, short-lived rise in gamma-ray emissions from the Crab in the fall of 2007, soon after AGILE was launched, the researchers didn’t believe it. Only when the craft recorded the 2010 outburst was the team convinced enough to go public with both findings. “If you say a steady source like the Crab is variable and it’s not true, you burn yourself for life,” Tavani said at the meeting. In a widely accepted model, the stage is set for any kind of gamma-ray emissions — steady or short-lived — when electrons hurled from the Crab’s central pulsar encounter strong magnetic fields in the surrounding debris. The electrons gyrate around the magnetic fields and get revved up to energies high enough to emit gammas. The short duration suggests the gamma rays originate in a relatively small part of the inner nebula. Buehler suggested that the pulsar’s own electric field helped accelerate the electrons in the inner part of the nebula to energies high enough to emit the gammas. Wlodek Bednarek and a colleague from the University of Lodz in Poland offered another explanation. In a paper posted at www.arXiv.org on November 19 (http://arxiv.org/abs/1011.4176), they suggest that the pulsar’s wind of charged particles rams into and compresses the magnetic field in the nebula. As the disrupted field snaps like a rubber band and reconfigures itself, it unleashes an enormous amount of energy that accelerates the electrons, the researchers propose. Astronomers are also trying to pinpoint the exact region from which the September outburst originated. As revealed in visible light and X- ray images, the nebula contains a complex array of wisps and jets. A series of portraits taken by the Chandra X-ray Observatory beginning a few weeks after the September flare shows that the base of one of the jets has brightened. This might be where the gamma-ray flare originated, says Tavani. The reserach may help shed light on the physics of a host of other astronomical systems that feature a central compact object, including black holes whose jets of charged particles slam into surrounding interstellar space.